The competition is, sort of, under way! Preliminary round kicked off two days ago with the champions of Andorra, San Marino, Gibraltar and Kosovo playing for one place in the first qualifying round. Lincoln Red Imps (Gibraltar) and FC Drita (Kosovo) play their final tomorrow. As it stands Liverpool would be in the third pot of seeds once again for the group stage UNLESS BOTH Benfica and FC Basel fail to win their 3rd qualifying round and then we would be seeded in the second group. Basel are gone. Good news. Draw for the playoff made. So if Benfica get past Fenerbahce they then have to get past PAOK or Spartak Moscow, second legs away in both cases. Benfica came away with a 1-0 home win over Fenerbahce so there is a shot at them crashing out thus getting us in the 2nd pot given the second leg will be played in Turkey. The first legs will be played on 21 and 22 August, and the second legs will be played on 28 and 29 August 2018. 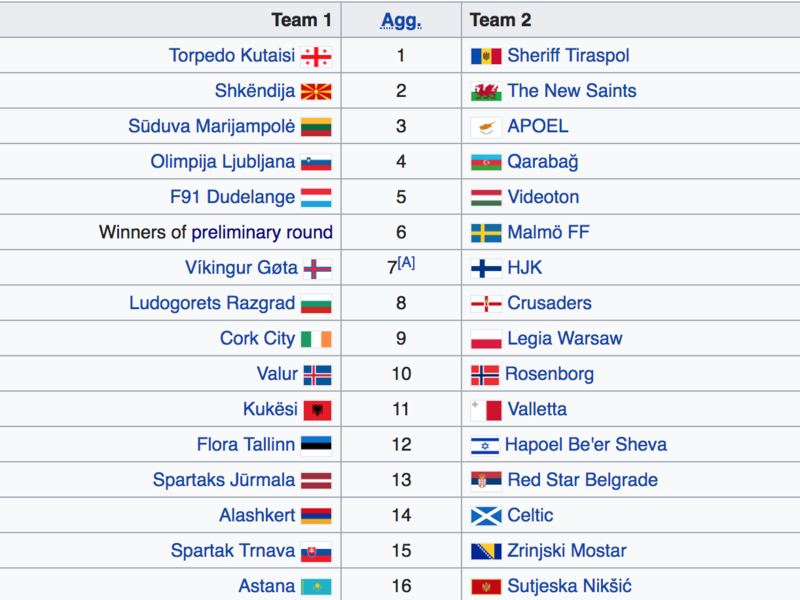 The losers from both Champions Path and League Path enter the 2018–19 UEFA Europa League group stage. Celtic already a goal down to AEK, 2-1 on aggregate to AEK. Celtic are sh*te under Rodgers. Get rid! Celtic used to be a team who would probably get in top six in PL. Now they're a team that would be in a relegation battle. I think they have been outstanding. Shut up you tart! Celtic haven't been a top 6 Premier League side for 15 years - stop rewriting history to suit a false narrative with a flimsy call for Rodgers sacking. You really don't help yourself sometime. 2015-2016 6th went to Southampton. 2012-2013 6th went to Everton. I did not say top 4, I mean those teams not good enough to be in top four! Rodgers European results have been dire, no getting around that. whatever Pot we are in, I bet we face Madrid in the group stages.